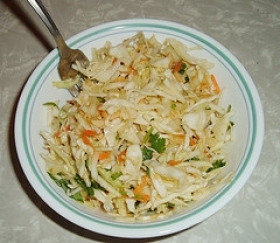 Have you made Buttermilk Slaw? 1. In a small bowl, whisk together the sour cream, buttermilk, vinegar, Worcestershire sauce, hot sauce, sugar, celery seed, salt, and pepper. 2. 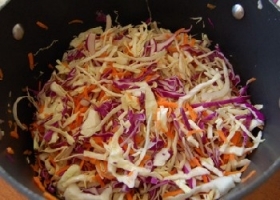 Remove the tough outer leaves from the cabbage and discard. 3. 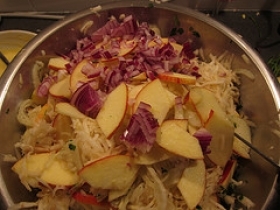 Quarter the cabbage; cut out the core. 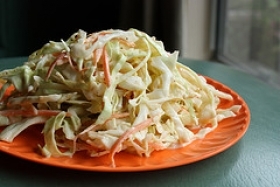 Using a mandoline or a thin sharp knife, slice the cabbage lengthwise into 1/4-inch wide shreds. 4. 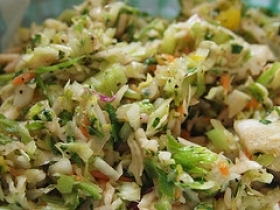 In a large bowl, toss the cabbage with the red onion, parsley, and the dressing. 5. 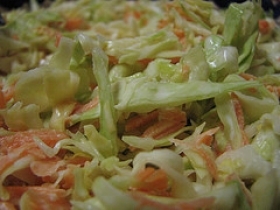 At this point the slaw can be refrigerated for up to 1 hour before serving. 6. 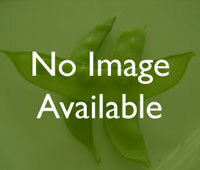 Add the basil, if desired, at the last minute. 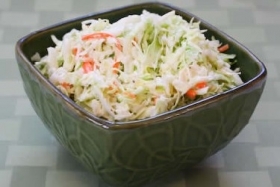 This recipe contains potential food allergens and will effect people with Milk, Butter, Sulfites, Malt, Cabbage, Natural Sweeteners, Celery, Vinegar, Onion allergies.